Predation accounts for a significant portion of sheep and lamb losses in the United States. The severity of the problem varies by farm and geographic region. For some producers, predator losses can be so overwhelming that they decide to liquidate their flocks. Other producers may never experience a loss due to predators. Regardless of the perceived predator threat, all sheep producers and owners of sheep should implement steps to prevent predation. There are various strategies for dealing with predators. Similar to internal parasite (worm) control, no one strategy will ensure success. Usually, it is a combination of practices which provides successful predator control. Non-lethal methods of predator control do not harm the predator and are favored by environmentalists, animal welfare advocates, and many producers. In most situations, predator control begins with a good fence. A fence is the first line of defense against intruders. However, predators can penetrate a fence by digging under, jumping between the wires, crawling through holes in the mesh, or jumping over the top of the fence. 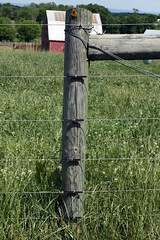 Woven wire (or net) fences in good repair will deter many predators from entering pastures, especially if vertical stays are no more than 6 in. apart and horizontal wires spaced 2 to 4 inches apart in the bottom portion of the fence. Although more expensive to install than high tensile electric fences, woven wire fences have many advantages and should be considered for perimeter or boundary fences. High-tensile, electric fencing is another option for predator-proof fencing. Perimeter fences should consist of at least five strands of high-tensile smooth wire. Increasing the number of wires will improve the effectiveness of the fence as a deterrent to predators. To be effective, the wires need to be properly spaced. The bottom wires need to be closer than the top wires. Where there is adequate soil moisture, all of the wires should be electrified. Otherwise, the fence should have a mixture of both live and ground wires. Four to eight inches is a good height for keeping sheep in and predators out. Absolute predator-proof fencing, although possible, is very cost prohibitive. One example of such a fence is 13 strands of alternating electric and ground wires, supported by line posts every 22 feet, with support stays every 11 ft. Fence lines need to be kept clean from vegetation. Weeds and grass that touch the fence will reduce voltage and lessen the effectiveness of the fence. Fencelines can be kept clean with herbicides or hand-held weed cutters. Livestock guardians are becoming an increasingly popular method of controlling predators. 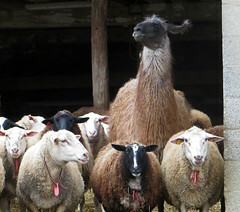 According to a USDA NAHMS Study, 45 percent of sheep farms employ a livestock guardian. 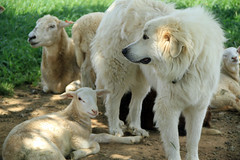 Livestock guardians include dogs, llamas, and donkeys. Predators attack mostly at night. 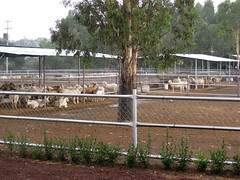 Penning sheep at night in lots near buildings and near humans will deter many predators. If the yard is well-lit, the risk is further reduced. Proper disposal of dead stock will prevent scavenging, which will help to keep coyotes and other predators away. A dead carcass, left out, can introduce coyotes to sheep predation. 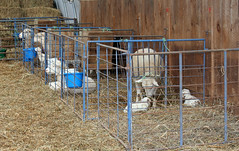 Shed lambing instead of pasture lambing helps protect vulnerable lambs. 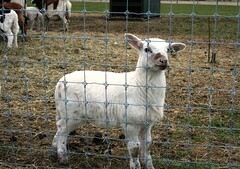 Newborn lambs are prime prey for predators. 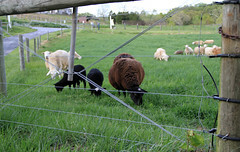 Pastures that have a history for high predation should not be used for lambing. Pastures that have rolling terrain and contain creek beds or brush provide ideal cover for coyotes. 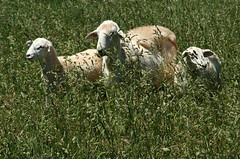 Shifting the lambing season to an earlier or later time may limit predation. For centuries, livestock producers have used frightening devices to ward off potential predators. Most predators are initially fearful of unexpected disturbances and keep their distance. Over the years, the devices have changed from simple scarecrows and bells or other noisemakers to more modern devices like the Electronic Guard. The Electronic Guard combines two scare tactics: light and sound. It has a light-sensing device that activates it at night and turns if off during daybreak, thus operating the device when predation is most likely to occur. 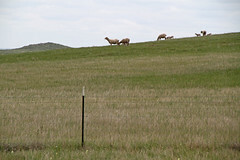 The number of Electronic Guards needed to protect sheep will depend on the size of the pasture, the vegetation in or around it, and the terrain. The Electronic Guard is a self-contained, 11-pound cylinder that can operate for approximately 60 days on a 12-volt alkaline battery. It is available from USDA Wildlife Services. Translocation is the capture of a predator and the release of it in another area. It is often done with "protected" predators such as wolves and bears. However, translocation is expensive and does not guarantee the predator will not cause damage in its new location or find its way home. It is becoming a less popular means of dealing with predation. Plastic collars were patented in 1998 as a control device for sheep. The collars cover the animal's cheek and underside of the neck. The collar prevents predation by predators that attack the throat (which most do) by denying them access. The collars can be used on lambs from a few days old to about a year old. The collars can be fitted and removed in less than a minute per sheep. Adjusting the collars for growth is equally quick and needs to be done every third week in young lambs and perhaps every 3 months in weaned lambs. The collar won several environmental awards for its South African inventors. Lethal methods of predator control result in the death of the predator and are necessary when non-lethal methods fail to control predation. While it is usually legal to kill coyotes, foxes, and mountain lions, it's important to realize that it is not legal to kill many other predators because they are protected by federal or state laws. For example, vultures are protected by the Migratory Bird Treaty Act. Bald Eages and Golden Eagles and their nests and nest sites are protected by the Bald Eagle Protection Act. Wolves and bears are protected under the Endangered Species Act. Hunting can be an effective way to reducing the local coyote population. The rationale behind hunting is that as the coyote population is reduced, there is less pressure on the natural food supply, so wildlife numbers rebound, in turn providing more natural food for the coyote population. Shooting is legal in most places. Coyotes can be shot from helicopters and fixed wing aircraft. Trapping is one of the most effective methods for controlling troublesome coyotes. Trapping is an effective way to remove coyotes. Leghold or snare traps can be used to kill troublesome coyotes. Snares are more selective. Unfortunately, trapping will also routinely injure or kill non-target species. Leghold traps are banned in many states. A steel leghold trap restrains the foot of a captured animal. After the animal is captured, it should be humanely destroyed. An experienced professional trapper should be used to remove predators. There are "padded" leghold traps which minimize the pain felt by the animal. A foothold trap is a jawed usually steel trap that is used to hold a wild mammal and operates by springing closed and clamping onto the leg of the animal that steps on it A snare consists of a wire loop with a locking device that tightens around the animal's body as it passes through the loop. Snares are most commonly set where coyotes are crawling under a fence. Snares are an alternative to steel traps. Snaring is the technique of setting a steel-cable loop in an animal's movement path to capture the animal by the neck or leg. Snares present several advantages over steel leghold traps. In a south Texas study, snares were 10 times more selective for target species (coyotes and bobcats) than steel leghold traps. However, snares can be a greater hazard to livestock and some non-target species may be killed. Public sentiment against the use of foothold traps to capture animals has increased in recent years. Eighty-eight countries have banned the use of leghold traps. Coyotes that attack lambs wearing a Livestock Protection Collar will receive a lethal dose of 1080 and die 2 to 7 hours later. The collar capitalizes on the killing behavior of coyotes. Coyotes typically attack sheep-sized animals by biting them under the neck and crushing the trachea, causing suffocation. The Livestock Protection Collar consists of two rubber bands which contain 15 ml of a 1% solution of sodium fluoroacetate (compound 1080). A larger collar containing twice as compound 1080 is not registered for use in the U.S. A pink or yellow dye is contained in the solution as a contamination indicator. The collar is held in place by velcro strips beneath the throat and behind the jaw of the animal. LPCs are most effective in areas with a high frequency of attacks and where other control measures have failed. They can only be used in cooperation with USDA Wildlife Services staff. They are authorized for use in 10 states (TX, SD, MT, NM, VA, WV, UT, OH, WY, and PA). Compound 1080 is under constant scrutiny. The M-44 works by injecting cyanide powder into the mouth of the predator. The ejector is triggered when the animal pulls back on the baited M-44 unit. The sodium cyanide powder reacts with the moisture in the animal's mouth, releasing hydrogen cyanide gas. Death occurs from 10 seconds to 2 minutes after the device is triggered. The risk of secondary poisoning of predators feeding on the carcass of an animal killed with an M-44 is nonexistent. The M-44 can only be used in cooperation with USDA Wildlife Services staff. Wildlife Services (WS) is a program within USDA's Animal and Plant Health Inspection Service (APHIS). Its primary mission is to resolve conflicts between wildlife and the public and create a balance that allows wildlife and people to peacefuly coexist. In recent years, WS's mission has expanded beyond agricultural damage to include minimizing wildlife threats to public health and safety. One of WS's responsibilities is to work with farmers and ranchers to reduce wildlife damage to livestock and crops. Before beginning any type of damage management program, WS checks to see if producers have properly utilized non-lethal management practices. In FY 2004, 75% of WS's research dollars were spent on non-lethal damage management tools and techniques. When non-lethal methods do not effectively reduce predation, WS provides the knowledge and skill to track, capture, and remove predators from locations where they are causing serious damage. In 1998, WS saved producers $3 to $6.75 for each dollar they spent.